But what defines “living well” ? For me, living well has always been a very abstract idea. Sort of an “I’ll know it when I see it” state of being. For my former business partner living well meant that he had become affluent enough to have a phone in the bathroom. I thought that having a car and driver would suffice. If I had to boil it all down, I would say that the easy and elegant life is simply more gracious and enjoyable. This site is my attempt to define how I could live a little more elegantly — living well, and well within my means. Together, we’ll explore what the French call “l’art de vivre” (what those folks in the photo above seem to have grasped so well), learning what constitutes elegance, how to cultivate your particular tastes, how to entertain your friends with style (and within a certain budget). In short, how to make your life a little more gracious. 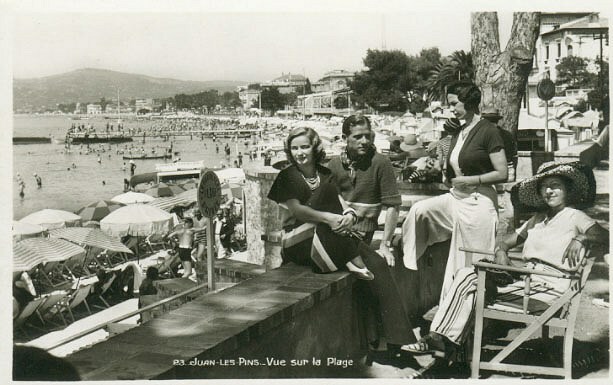 As for Juan Les Pins? It’s changed since the photo was taken, but there is a wonderful jazz festival there every year. If you can get to it, you won’t be disappointed. This entry was posted in Elegantology and tagged Elegantology, Living, Murphy's, travel. Bookmark the permalink.